Ballymore Stables will present four runners across two meetings, Te Rapa and Matamata, this weekend and all are heading into their respective events with very strong chances. The lightly tried son of Makfi, Makarios (pictured), was awfully unlucky at his last outing after being held up at a vital point in the race, although looks well placed to make amends this Saturday in the Rating 65 event over 1400m. Rider Danielle Johnson has been engaged once again and she was certainly adamant the three-year-old had plenty of running left at his last start and is determine to get it right this time in. “He’s a horse we have plenty of time for and is still learning what everything is about – he’s a nice horse in the making,” said co-trainer Chad Ormsby. The second runner at Te Rapa will be Derby contender All Knitted Up who lines up in the Rating 65 event over 2100m and will also have the services of Danielle Johnson. All Knitted Up was due to run last weekend in the Group 2 Waikato Guineas over 2000m, although an elevated temperature on race morning prevented the son of Mastercraftsman from starting. “He’s a horse with plenty of upside and is continually improving and developing,” Ormsby said. Onto Sunday where the local meeting (Matamata) takes place and the team will have another two runners including the long awaited return of Lorde Royals. Lorde Royals won a trial as a two-year-old against subsequent Group 1 winner Marky Mark, before running in a strong juvenile event which saw him battle due to a wind problem. Following a break and another start as an early three-year-old, the son of Postponed was still enduring issues and was eventually operated on and put aside. 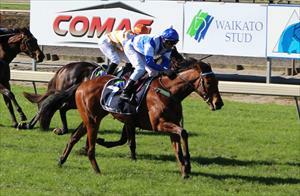 Lorde Royals has drawn barrier six in a seven horse field and will be ridden by international jockey Mark du Plessis. The second runner on the card who has also encountered his fair share of setbacks, Arbitrage, will be looking to keep the Derby dream alive as he lines up in the Rating 75 event over 1600m against the older horses.